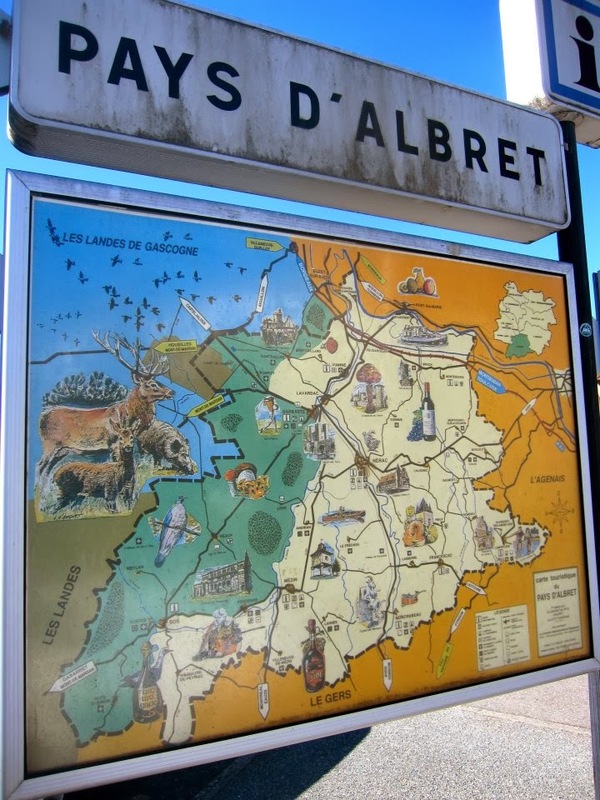 Planting Cabbages: French Travel Adventures: Marche Dimanche. Part Two. French Travel Adventures: Marche Dimanche. Part Two. Please read Aperitif for the first part of this adventure. Inspired by a beautiful trip in the Fall of 2011 to Poudenas, a beloved and petit village in the rustique Southwest of France. Won't you come along, this summer and fall, for Twelve Days in Paris and Gascony? Part Two, Plat du Jour. After we parked, we walked into the Mezin market. 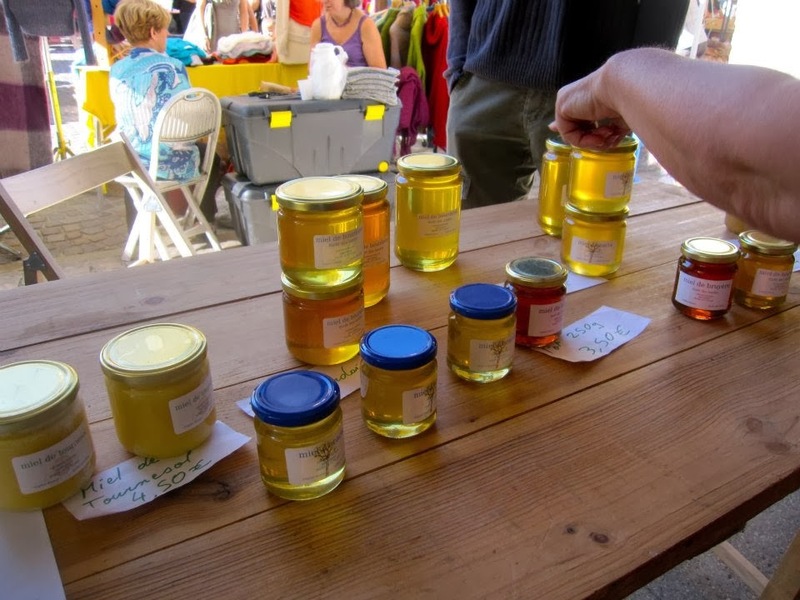 Alice stopped to admire the honey of, and to engage as only as an emphatic American with a French beekeeper can, loudly. Erick wandered off to explore the market like the chef he is. Once around or twice? To peruse and then plan. I didn’t need a conversation, I was attracted to the light coming in through the jars. I bought a divine honey, a chestnut honey. As I paid my 8 euros I heard Alice grow more emphatic. “Bio, Bio, Ferme,” she loudly said, as if this would make things crystal clear. I listened in as their conversation continued. “D’accord. 4 km out of Poudenas.” Alice confirmed. “Non. 5.” The beekeeper kept on with his other customers. “A hill with 3 pine trees?” Alice repeated as if she understood perfectly. I wasn’t sure he had understood that maybe she didn’t understand. “Turn right there. Aha. 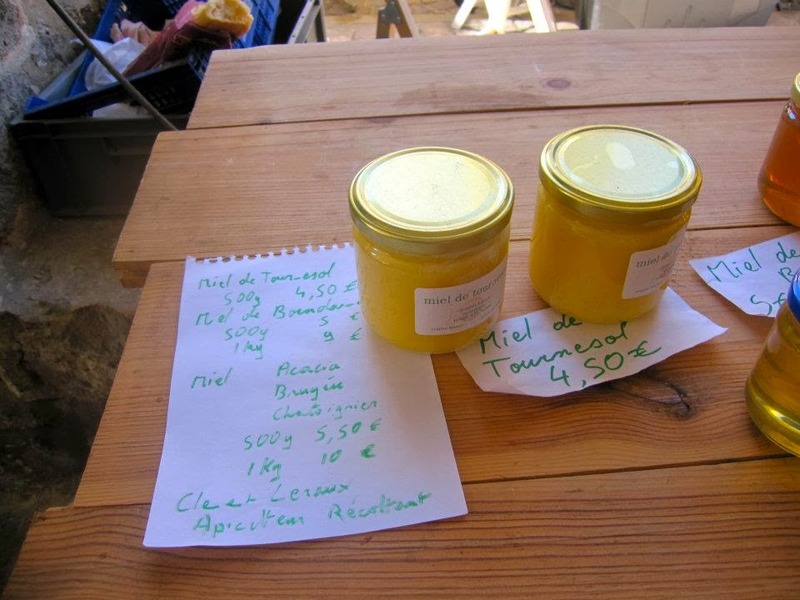 Parfait.” Alice scooped up her four jars of honey to add to her growing collection of honey she had begun in Paris. More photos ensued. Then we all wandered off for a bit to do our own thing. A pretty lacy brown scarf caught my eye, and made me remember the Saturday Market in Arles, Provence. I looked forward to the big Saturday markets, and a day off from writing. 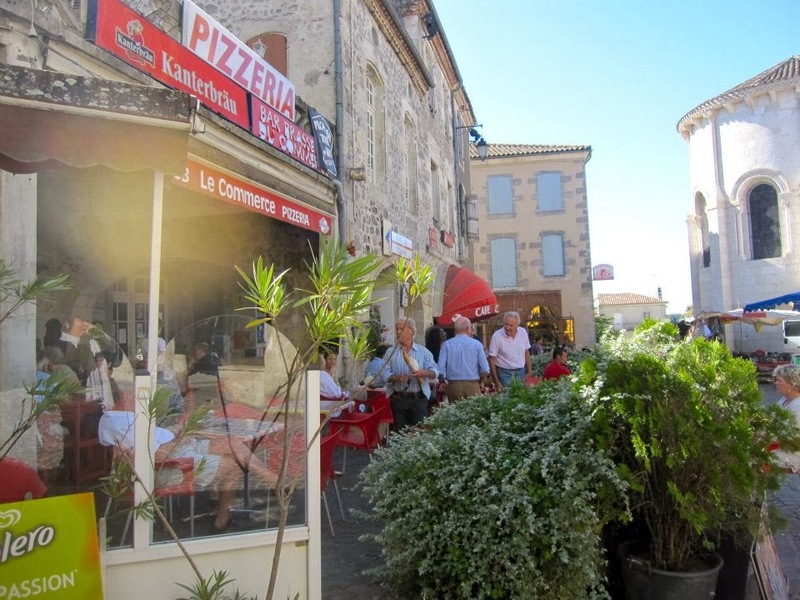 In Arles, the market stretched with tables of lavender and sunflower honey down and across the main road, Boulevard des Lices, before curving up to the Quai de la Roquette at the Rhone River. Here the Pilgrimage Route to St Gilles goes off on its merry way. Ah, the wide Rhone – the barges that go up and down to the Mediterranean. What bliss, wistfulness, and getting lost in market, at market. 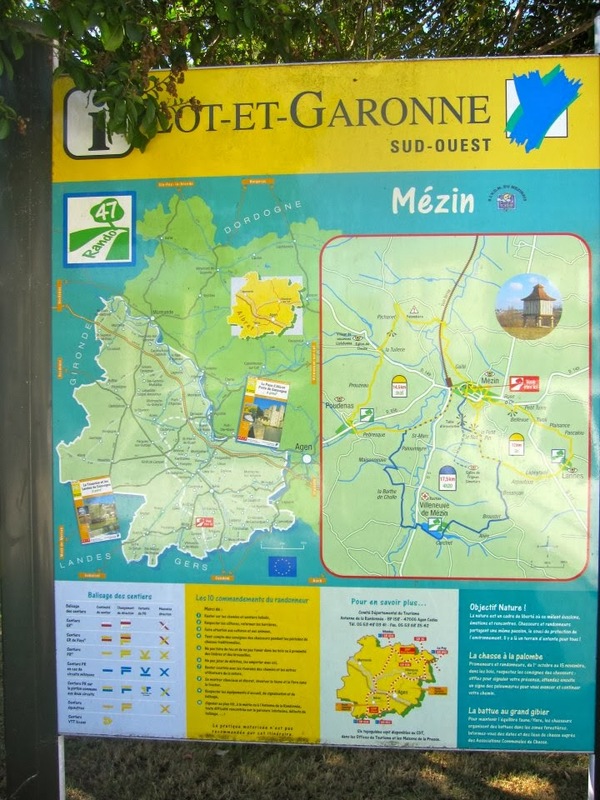 It might not seem so but Gascony is connected to Provence directly by the market and by the honey, and by the path of pilgrimage, as a host of visitors wandered to village and town on their journey. But at the Mezin market, the Rue du Pont, and the bridge over the much smaller Gelise River was a little ways out of town. It marked the pilgrim’s route from Vezelay. From here the age old path continued on though Montreal du Gers and then into Condom, and Auch. There are arguments as to whether the new path goes through Mezin, but it still marks the old way. There was no getting lost in this small market. In contrast, the church, the Presbytere Catholic Church that was built from the 10th-14th Century overshadowed the market. Mezin’s Marche Dimanche, Sunday Market, was a glimpse into a week of Gasconne markets. I looked up and could easily spot Erick and Jen wandering. And Alice, no problem. I could hear her laughing. Erick and I gathered at the fromagerie - what beautiful cheeses! I felt a great deal of angst over choosing the right one. Was there a perfect cheese to grace the dinner table perched in front of the window looking over the pond tonight? The vendors lined the Mezin town square by the church. The clock on the church tower clearly showed it was 11:30. We circled and went out to the street to see about a charcuterie or a boucherie. The boucherie Erick had seen was closed, so we went into another charcuterie and saw whole ducks and without wasting a moment bought two then also some tarte au gasconne, which had little dices of magret fume or smoked duck. We wandered back to market to find most of the vendors were closing up. The small store was already closed. Alice bought milk at the fromagerie that Erick and I had just left, and she quickly was dubbed the Milsch Maiden as she seemed to be carrying a liter of milk with her everywhere. Along with honey. Gascony has been known as the land of milk and honey, and she was taking this very seriously. I laughed. What were we all searching for? Marche Dimanche, Sunday Market in Mezin was oddly quiet, though the bells chimed 12 times for Midi. Not one inhabitant ventured in, it was only visitors who streamed in and out of the church, taking photos. At lunch, I would find the courage to mention the 27 bells.